Photopolish is your ultimate watermarking tool. Would you like to be able to watermark your Photography in one brilliantly simple and ultra fast application that gives you the ability to watermark your Photography with the absolute freedom you need in todays fast paced digital photography world? 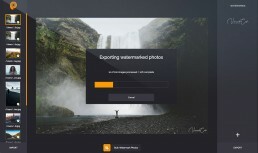 Imagine having the ability to watermark one photo at a time or bulk watermark all your images at once in a matter of seconds at the click of a button. Photopolish is going to speed up your workflow providing you with the tool a passionate Photographer like you needs. And the best part? Photopolish will save you hours and many headaches that come with applying watermarks in other applications. Photopolish is truly the ultimate watermarking tool, the polishing touch to your Photography toolkit. But hey, here's 60% off! images in a single click. Store your Photologo in you watermark wallet and enjoy one click watermarking. Automatically place your watermark in the perfect spot on every photo. 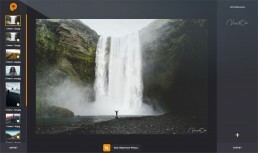 Bulk watermark all your images in a single click. Flawlessly resize and move your signature at 360° & freedom. fast and a cuts through the crap, an easy, quick watermarker. * Fixed onedrive issue affecting exports. * Added support for importing 8bit grayscale photos. * Changed Watermark Wallet to accept duplicate filenames. * New and improved Toolbar. * Added Snapping features, including Magic Snap. * Simpler renaming for exported images. * Other various touch ups. * Fix – Cannot delete items from Watermarks panel. * Added temporary workaround to allow 32-bit, CMYK jpegs to convert to png by dropping color profile and using rgb. * [Windows] Fix export failure on some systems by bundling VC++ 2013 Redistributable. * [Mac] Reduce install size further. * Export preserves photo metadata. * Export preserves color profiles. * Improved bulk watermark placement. * Polished some user interface elements. * Fix – Import broken with certain characters in path. * Updated runtime libraries, and other misc internal improvements. * Add – New Export dialog. * Fix – Not importing files with uppercase extensions. 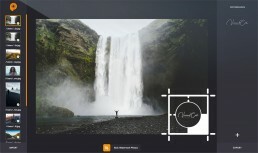 * Add – Controls for watermark opacity. * Add – This changelog. * Fix – Not importing files with ‘.jpeg’. * Fix – Guard against exporting no photos with information dialog. * Fix – Some capitialization in menus. The Company is committed to protecting your privacy. In order to provide a quick and accurate response to your Photologo signature order, the Company asks only for the information necessary to complete your order with precision. All the information is strictly for the use of Company and its employees, it will not be shared with any other third party. Company uses state of the art technology to protect your privacy when you place an on-line order. 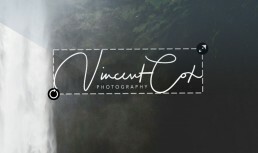 When you order a Photologo signature, we need to know your name, your company’s name, Photologo signature, your email address, and your mailing address. This allows us to process and complete your order and to notify you of your order status. We also ask some information about you or your company or how did you find us etc. All the rights to the work product we create at the request of a client belong to such client. This is a legally binding agreement between you (either an individual or a single entity), referred to herein as “YOU”, and Echko Ltd, referred to herein as “Echko”. This software entitled Photopolish is referred to herein as the “SOFTWARE”. Installing, opening or using all or any portion of this software indicates your acceptance of all the terms and conditions of this End-User License Agreement referred to herein as “EULA” and that this agreement is equivalent to a written agreement signed by you. By using, installing or purchasing the Software, you are providing your acceptance of the terms of this agreement. This agreement is enforceable against you and any legal entity that obtained the software and on whose behalf it is used. If you do not agree to the terms of this agreement, please do not use this software. It is illegal and strictly prohibited to distribute, publish, offer for sale, license or sublicense, give or disclose to any other party, this software in hard copy, digital form or any other medium whether existing or not yet existing, except as specifically permitted below. 1.1 You are granted an unlimited (no time restriction), but non-exclusive license to install the Software for your own use provided that such computer does not render the Software accessible to other users through local or Internet networks or other methods. Only the individual who installed the Software, as indicated by the user information provided when installing the Software, will have the license to use the Documents. Use by any other person, company, affiliate, trust, or other separate legal entity will require a separate license. This includes companies that may be affiliated to you by ownership or otherwise. The license granted herein shall remain in effect perpetually, but shall terminate upon your use of the Software beyond the scope licensed herein or upon your violation of any term or condition hereof. All protections with which Echko is provided under this EULA shall survive the termination of your license to use the Software. 2.1 Echko and its suppliers retain all title, ownership, and intellectual property rights in the Software, including but not limited to all supporting documentation, files, marketing material, images and multimedia. The Software is protected by copyright and other intellectual property laws and by international treaties. The Software may include security measures designed to control access and prevent unauthorized copying and use. You agree not to interfere with any such security components. Echko permits you to download, install, use, or otherwise benefit from the functionality or intellectual property of the Software only in accordance with the terms of this EULA. 3.1 Each party agrees that it shall not disclose to any third party any information concerning the customers, trade secrets, methods, processes or procedures or any other confidential, financial or business information of the other party which it learns during the course of its performance of this EULA, without the prior written consent of such other party. This obligation shall survive the cancellation or other termination of this EULA. The Software contains trade secrets and proprietary know-how that belong to Echko and it is being made available to you in strict confidence. ANY USE OR DISCLOSURE OF THE SOFTWARE, OR OF ITS ALGORITHMS, PROTOCOLS OR INTERFACES, OTHER THAN IN STRICT ACCORDANCE WITH THIS EULA, MAY BE ACTIONABLE AS A VIOLATION OF ECHKO’S TRADE SECRET RIGHTS. 4.1 You may not rent, lease, sell, sublicense, assign or transfer your rights in the software, or authorize any portion of the software to be copied onto another individual or legal entity’s computer. 5.1 Upon fulfilling your obligations towards properly installing and registering the Software or obtaining a valid Software license key, you may make one copy of the original media on which you obtained the Software solely for backup or archival purposes. You may not otherwise make copies of the Software. You agree that any copies of the Software which you make pursuant to this EULA shall bear all copyright, trademark and other proprietary notices included therein by Echko and, except as expressly authorized herein, you shall not distribute the same to any third party without Echko’s prior written consent. 6.1 Only distribution of the full and complete unaltered software application is allowed provided that Echko has given you prior written authorization and that all trademarks, ownership and copyright notices remain in the Software. 7.1 You may not: (i) modify or create any derivative works of the Software or documentation, including customization, any modifications or enhancements, translation or localization without Echko’s express written consent; (ii) reverse engineer, decompile, disassemble, make or otherwise attempt to derive the source code of the Software, or the underlying ideas or algorithms of the Software; (iii) attempt to gain unauthorized access to Echko servers or any other service, account, computer system or network associated with the Software or with Echko, its affiliates, agents, partners and customers; (iv) remove or alter any trademark, logo, copyright or other proprietary notices or symbols in the Software; (v) block, disable, or otherwise affect any advertising, banner window, tab, link to websites and services, or other features that are part of the Software; (vi) incorporate, integrate or otherwise include the Software or any portion thereof into any software, program or product; (vii) provide false information when registering the Software; (viii) digitally transmit or make available the Software or its content through local networks, intranets, extranets, FTP, online discussion boards, forums, list-serve, peer-to-peer networks or technologies, newsgroups, bulletin boards, or any other mode of shared communication system, or place the Software onto a server so that it is accessible via a public network such as the Internet; (ix) use the Software in any way that violates this EULA or any law; or (x) authorize or assist any third party to do any of the things described in this section. 8.1 Certain features or content of the Software may require the purchase of a Software license key. You agree not to attempt to, and not to, control, disable, modify or remove any component of the Software license key protection system. You also agree not to access, attempt to access, copy, share or distribute the license key for any purpose. 9.1 Echko is frequently working on building Photopolish updates to include new features, all updates within the version you’ve purchased are free. By using the Software, you consent to receiving software updates, modifications, and/or patches that address issues such as security, interoperability, and performance, which need to be downloaded manually from us. Your use of the updates shall be governed by this EULA unless you are asked to agree to a new EULA at the time of download or installation. 10.1 During the installation process, or at some time thereafter, you may be asked to provide certain information that will be used to personalize certain Documents, send you Echko information via email or mail, and customize some information presented to you through the Software. For example, you may be asked for your state/Territory /country, which could be used by the Software to provide you with locally relevant and/or related products. All personal and billing information is transmitted using the secure SSL protocol. Both personal and non-personal information collected by the Software is safeguarded according to the highest privacy and data protection standards adopted worldwide, and will not be shared or given without your consent. 12.1 YOU ACCEPT THE SOFTWARE “AS IS” AND WITH ALL FAULTS (IF ANY). ECHKO DISCLAIMS ALL WARRANTIES, EXPRESS OR IMPLIED, INCLUDING BUT NOT LIMITED TO WARRANTIES OF MERCHANTABILITY AND FITNESS FOR A PARTICULAR PURPOSE. 13.1 Echko reserves all rights not specifically granted to you above. Echko will have the right to proceed against you in the event that you infringe against Echko’s rights. Any use not within the precise scope of the license set forth herein will be considered an infringement. You acknowledge and agree that Echko’s damages in the event of your violation of this EULA will be substantial and that Echko will suffer irreparable harm in such event. As such, Echko shall have the right to obtain equitable remedies, including but not limited to recovery of damages, obtaining injunctions, recovering statutory damages, recovering Solicitor fees, and any other available legal remedy. 14.1 Echko shall have the sole and exclusive right to immediately terminate this EULA and suspend your license to use the Software should you fail to perform any obligation required under this EULA or engage in activity that Echko deems harmful to its well-being. This EULA takes effect upon your installation of the Software and remains effective until terminated. 15.1 Echko’s waiver of any breach of this EULA shall not constitute an amendment to this EULA or Echko’s waiver of subsequent breaches. If any part of this EULA is found void and unenforceable, it will not affect the validity of the balance of this EULA, which will remain valid and enforceable according to its terms. 16.1 You consent that Echko may provide you with information and notices regarding the Software and Echko via the email address you designate when installing the Software or thereafter. Echko may provide notices to you via (i) email if you have provided Echko with a valid email address, or (ii) by posting the notice on the Echko website or the Software download site which Echko owns and operates. You may withdraw your consent for electronic notices. 17.1 Echko reserves the right to unilaterally amend all offers, pricing terms or other matters pertaining to the Software, Echko’s website or this EULA. No course of dealing or trade usage shall be deemed to amend the terms of this EULA. 18.1 This EULA shall be governed by and construed under the laws of Hong Kong. You consent and agree that all legal proceedings relating to the subject matter of this EULA shall be maintained in courts sitting in Hong Kong, and that jurisdiction and venue for such proceedings shall lie exclusively with such courts. Photopolish is a non refundable product, as it is a digital product that cannot be returned. – Photopolish is for single use only, meaning, 1 licence per person. You may use Photopolish for personal and commercial purposes, however if being used by a large team (i;e: a company) you will be required to purchase a licence per person/computer. 20.1 This is the entire EULA between Echko and you relating to the Software and it supersedes any prior representations, discussions, undertakings, warranties, communications or advertising relating to the Software.